The Arabia Foundation appeared in spring 2016, seemingly out of nowhere, as a Saudi-focused think tank with “ties to Riyadh,” but vaguely independent of the regime. Or at least independent enough so that media wouldn’t represent it as an extension of the kingdom. But the past few weeks have clearly shown it to be little more than a PR outlet for de facto Saudi ruler Mohammed bin Salman and his sprawling, opaque business interests. After multiple requests by FAIR for its donors, the Arabia Foundation refused to give any, other than its founder, Saudi investment banker Ali Shihabi. It insists it doesn’t take money from “the Saudi government,” but instead is backed by unnamed private Saudi citizens. 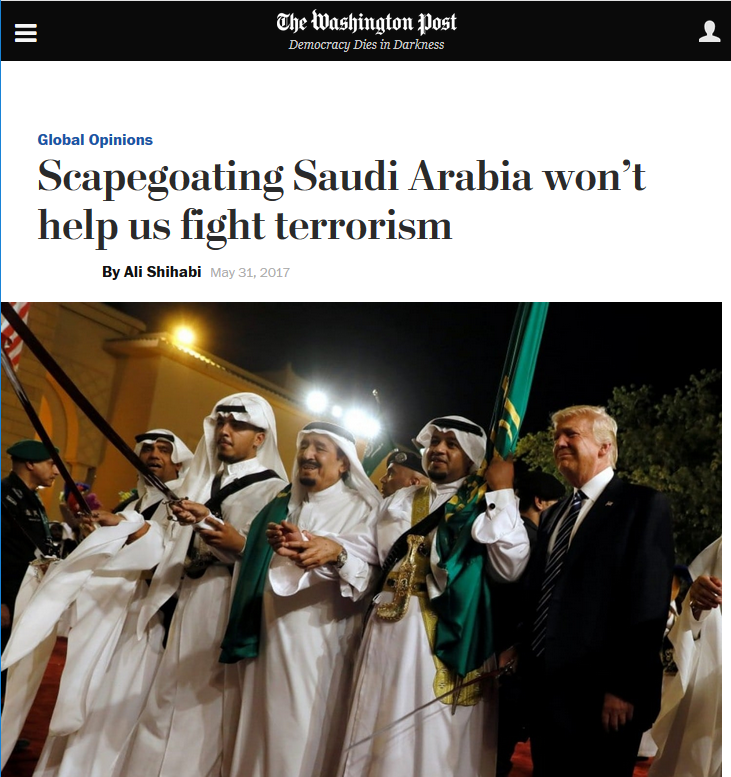 Image: A Saudi government spokesperson couldn’t have said it better (Washington Post, 5/31/17). 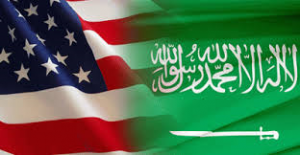 The New York Times (11/30/18) has described the group as “close to the Saudi government,” while the Washington Post’s Ishaan Tharoor (11/6/17) noted it had “close ties to the kingdom.” That doesn’t stop the Post opinion section from running multiple op-eds from Arabia Foundation figures (5/31/17, 12/20/17, 1/4/18, 1/22/18). In most press appearances, the group is simply identified as “a Washington-based think tank.” Absent documented evidence of who exactly funds the group, why should media not assume—based on its connections to the government and cartoonishly pro–bin Salman line—that the Arabia Foundation is a front group for the government? In repeated interviews (BBC World News, 3/20/18; Morning Joe, 3/20/18; CNN, 3/19/18) last week, Shihabi, the head of the nominally independent group, spun for war crimes, human rights abuses and a whole host of morally dubious activities carried out by the increasingly despotic Saudi ruler. The Arabia Foundation’s ties to the Saudi government are never noted or even vaguely referenced in these interviews. No one on the panel brought up Saudi Arabia’s ongoing war crimes in Yemen—consistent with MSNBC’s network-wide virtual blackout on one of the world’s worst humanitarian crises (FAIR.org, 3/20/18). The Council on Foreign Relations’ Richard Haas made one opaque reference to Saudi “war with Yemen,” but didn’t note the thousands killed or up to one million infected with cholera; the US-backed war was was simply dismissed as a “strategic overreach.” The New York Times’ Elisabeth Bumiller, another panelist, did get in a question about torture, which Ali Shihabi dismissed as having “no evidence” despite Bumiller speaking with several doctors who witnessed it. Reliable Saudi stenographer David Iglesias who, as FAIR (4/28/17) noted last year, has been running the same reformist press release for the royal family for 15 years, continued his unique brand of faux criticism, insisting that the Saudi prince was too “bold”—the political commentary equivalent of answering “I work too hard” when asked on a job interview what your biggest flaw is. 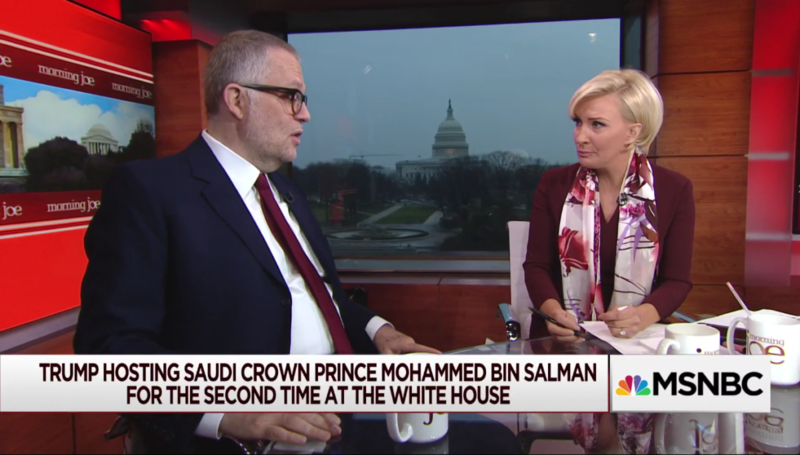 Shihabi claimed without irony that what Saudi Arabia needed was “autocracy to affect change,” and a “benevolent autocrat.” His evidence that the masses approved of bin Salman’s “bold, needed” leadership was approved of by the masses? That there has been “no bloodshed, there’s been no demonstration, no domestic strife.” Of course, the last time there were anti-government demonstrations, in 2011, the Saudi military opened fire on protesters, and snuffed out resistance with torture and extrajudicial killings. In 2017, when one Shia town resisted the regime, Riyadh flattened an entire neighborhood. This could perhaps be why the general population isn’t quick to take to the streets, but the Arabia Foundation insist it’s an implicit admission the crown prince is loved and popular. The CNN and BBC interviews, likewise, didn’t note the Arabia Foundation’s obvious ties to the Saudi regime. Image: A typical Forbes post (2/1/18) by Arabia Foundation “non-resident scholar” Ellen Wald. Forbes keeps running “op-eds” by Arabia Foundation fellow Ellen Wald that amount to little more than press releases for Saudi investment opportunities (e.g., 12/11/17, 2/1/18, 3/13/18). Another pundit on the Arabia Foundation’s payroll, Bernard Haykel, writes fawning profiles of bin Salman in the Washington Post (1/22/18) without disclosing he’s a founding director of the organization—instead listing his more benign academic credentials. The Arabia Foundation is so satisfied with the media’s presentation of its messaging that it routinely tweets out articles it’s featured in and TV appearances it’s had, knowing its messaging is syncing up nicely with bin Salman’s PR tour to the United States. “Yemen is a tragedy. Wars are a tragedy. Saudi is aware of that and is going out of its way to try to address humanitarian issues there,” boasted one tweet, quoting Shihabi’s interview with the BBC. By contrast, this obtuse inability to connect dots is absent when discussing think tanks “close to” the Syrian government. Never is the Assad-connected British Syrian Society set up as a neutral arbiter of affairs of the Syrian conflict. It is met with disdain, painted as “little more than a Syrian regime propaganda exercise” (Guardian, 10/26/17), the “mouthpiece in the West” (Middle East Eye, 10/19/17) for a war crime–committing tyrant. Those who associate with it, including academics, journalists and British members of parliament, are publicly shamed for participating in a “regime PR exercise” (Independent, 10/29/16). Yet somehow the “Saudi-connected” Arabia Foundation, which cheers on a “benevolent autocrat” as he rains bombs on Yemen and uses hunger as a weapon of war, receives no such moral banishment. Instead, it is dressed up as just another respectable think tank. With all the hysteria surrounding RT and foreign influence on the American public, one might think such an obvious racket would give editors and TV producers pause. But the same rules don’t apply to American allies. Their propaganda is treated not like a sinister “influence operation,” but like a respectable group of academics calling balls and strikes on international affairs.